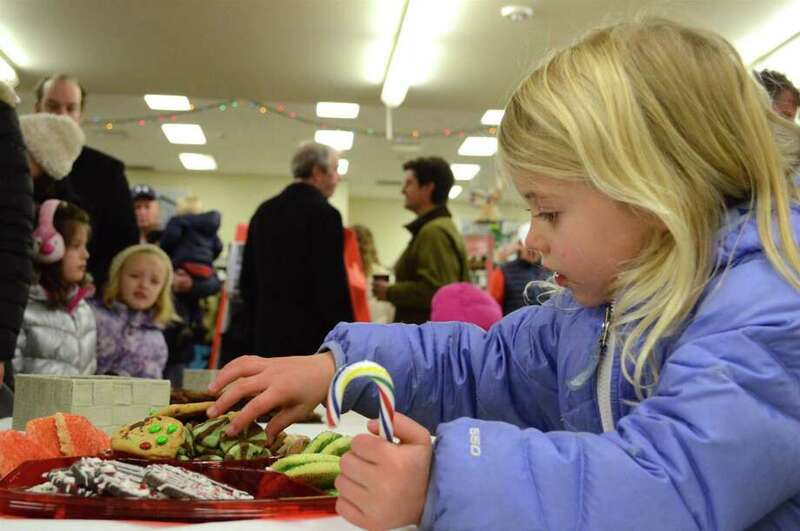 Chandler Drexler, 4, of Darien samples some sweets at Santa's Arrival at Greggs Garden Center & Landscaping, Dec. 9 in New Canaan. The TD Charitable Foundation awarded a $5,000 grant for the Person-to-Person Emergency Assistance Program. TD Bank, through the TD Charitable Foundation, carries a legacy of supporting not-for-profit institutions and their important work throughout the region. Established in 1968 to provide low-income individuals and families living in Lower Fairfield County with basic emergency services, the Person-to-Person service area includes Darien, New Canaan, Norwalk, Stamford, Weston, Westport and Wilton. The First Congregational Church of Darien is hosting a candlelight Christmas concert, “An Evening of Festive Music,” on Saturday at 7 p.m. The concert, at 14 Brookside Road, will feature the Darien High School Tudor Singers. Choir soloist will perform popular Christmas songs accompanied by Maxim Pakhomov. There will also be quartet singing and a carol sing-along. No ticket is required and all are welcome. However, attendees are encouraged to donate a freewill offering to benefit Habitat for Humanity of Coastal Fairfield County, a nonprofit organization that builds communities and improves lives by eliminating substandard housing and creating affordable homeownership possibilities for families in Fairfield County. Jon Zagrodzky, chairman of the Board of Finance, will talk about the impact of state-level budget challenges at the Darien Men’s Association Dec. 20. The town’s annual budget is $140 million. He also will comment on broader governance issues for Darien and the state of Connecticut. Zagrodzky has been a Board of Finance member since 2008 and also serves on the town and police pension boards and the Public Works Garage Building Committee. He is also the chief operating officer for Rhone Group LLC, a middle-market private equity firm. His talk will start at 10:45 a.m. DMA meetings are held at the Darien Community Association, 274 Middlesex Road. To encourage donations, all those who give blood or platelets Dec. 21 through Jan. 7 will receive a long-sleeved Red Cross T-shirt, while supplies last. Dec. 20: 7:30 a.m. - 5:30 p.m., Bridgeport Hospital, 267 Grant St.
Dec. 24: 8:30 a.m. - 1:30 p.m., Temple Shalom, 259 Richards St.
Dec. 27: 11:45 a.m. - 4:45 p.m., Walgreens, 55 Westport Ave.
Dec. 23: 8 a.m. - 1 p.m., St. Theresa Parish, 5301 Main St. This Tchaikovsky holiday classic is abbreviated to an hourlong narrated show, specifically geared for young audiences. Children get to sit up close and are invited to meet and greet the characters after the performance. Performances will be held at the DAC Weatherstone Studio at 2 Renshaw Road, behind Town Hall. Show times are Dec. 16 and 17 at noon and 3 p.m. Tickets are $10. Reservations are highly recommended as performances sell out quickly. Call the DAC at 203-655-8683 or email Bonnie@darienarts.org for reservations.